Brief：Agreements come as leader of African nation makes first official visit to Beijing in seven years. President Xi Jinping (L) holds a welcoming ceremony for Angolan President Jose Eduardo dos Santos before their talks in Beijing, June 9, 2015. China and Angola sealed eight agreements on Tuesday covering areas such as economic cooperation, transportation, electricity and financing as Africa's second-largest oil producer continues to face problems caused by falling crude prices. 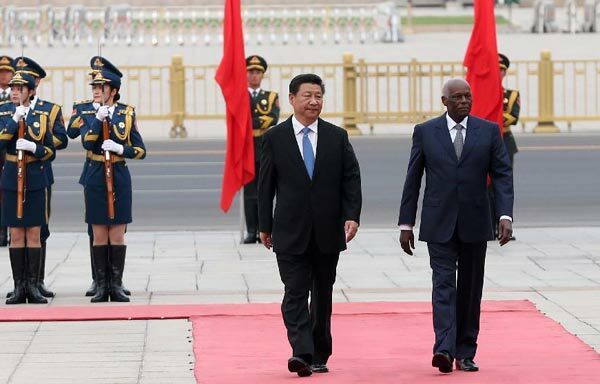 The agreements were signed in Beijing after a meeting between President Xi Jinping and Angolan President Jose Eduardo dos Santos, who arrived on Monday for his first official visit to China in seven years. China is willing to help Angola transform its rich natural and human resources into development results and achieve independent and sustainable development, Xi said. China will encourage its enterprises to invest in Angola, participate in its industrial parks and infrastructure construction and help it to diversify its economy, he added. Xi called for the early signing of further agreements covering currency swap, investment protection and avoidance of double taxation. Dos Santos reaffirmed his government's commitment to diversifying the economy, and said the administration hoped to see greater cooperation with China in sectors such as infrastructure, education, agriculture, industry and financing. 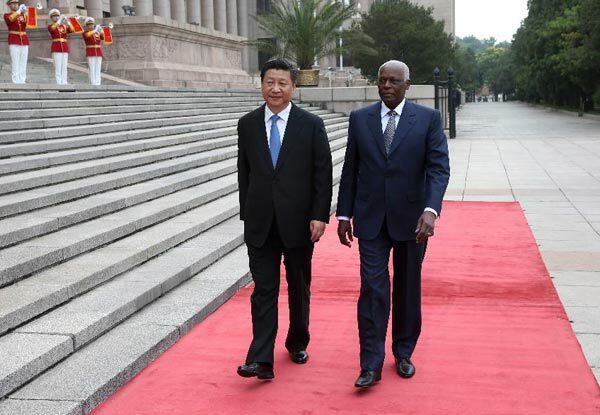 Angola, at a critical stage of economic rebuilding and industrialization, needs and looks forward to more Chinese investment, Dos Santos said in a separate meeting with Premier Li Keqiang in Beijing. Angola registered a decade of strong growth boosted by oil reserves and reconstruction projects after its civil war ended in 2002. However, government revenues, which rely heavily on income from oil, have been hit hard by the steep fall in prices. Cooperation opportunities exist even though Angola's development is under increasing pressure, said Gao Kexiang, China's ambassador to Angola. He said the countries could focus on cooperation over industrial capacity. China is Angola's largest trading partner and oil importer and a leading source of investment. Angola is China's second-largest oil supplier globally and trading partner in Africa. Two-way trade reached $35.1 billion in 2013, a 50-fold increase from the start of the century, and accounted for 40 percent of Angola's total foreign trade. Deng Yanting, a researcher of African studies at the Chinese Academy of Social Sciences, said energy is not the only factor in the cooperation between the countries, as China has helped Angola to reduce its reliance on oil and build sound industrial and agricultural systems. With China's financial and technological support, Angola has the potential to become a successful model for Sino-African cooperation, said Deng.